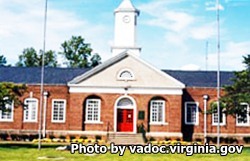 Virginia Correctional Center for Women is level 2 prison located in Goochland Virginia. It houses approximately 590 female inmates. The facility was originally opened in 1931 and has since had several additional buildings added to it. Virginia Correctional Center for Women is situated on 260 acres of land and is comprised of a total of 30 structures. Inmates are housed in five general population buildings. An additional building is used to house a restrictive unit. Inmates have access to a 24 hour medical unit, a dental clinic, and mental health services. Counseling and other services are coordinated through the inmate's case manager/counselor. Some of the programs inmates can participate in include anger management, thinking for a change, and the MATRIX substance abuse treatment program. Inmates at Virginia Correctional Center for Women can earn a GED and take college level courses through a correspondence course, offered through two universities; J. Sargent Reynolds Community College and Louisiana State University. This facility participates in the Virginia Correctional Enterprise program and employs inmates in an industrial laundry operation, and in converting old paper documents to electronic files (data entry). An additional work program offered to inmates allows them to work in a meat processing plant. Virginia Correctional Center for Women also offers an intensive 140 bed substance abuse and cognitive community therapy program. The therapeutic community program provides a residential treatment program to women everyday all day long, and offers a supportive community that increases an inmates chance of positive change. An additional pre-release program is available for women who are nearing discharge. The pre-release program lasts 6 weeks and is mandatory. It provides offenders with life skills and the resources they will need to re-enter society successfully. Before you can visit you must have a current approved visitors application on file. Visitation is held on Saturdays and Sundays. The exact day and time an inmate is allowed visitation is on a rotating schedule, contact the facility for more information.